Non-profit and association management software created with multi-branch organizations in mind. Who’s a member? Who attends which branch’s events? Who’s renewed? No more wondering with your single, connected database. With a complete set of tools at a fraction of the typical cost, the addition of new branches is a breeze to manage. With SilkStart, each branch gets a template approved by the parent organization that they can configure to their local needs. Content, events, news and more is easily shared between branches and up to the parent group. Better yet, propagate content from the parent down to your branches. Branches, Clubs, Districts and Regions - you name it, SilkStart is customizable to meet your needs. Make better decisions with complete data and reporting. Parent organizations can generate a full range of detailed metrics, by branch or by the whole organization. Learn how each branch is performing with detailed reports showing revenue, retention rates, and more. Manage the paper trail - branches can charge at the branch level, the national level, or both. Delight your members with consistent or differentiated branding across your organization. Make a group for your branch admins, your team, or anyone - so everyone is in the loop. Parent administrators can easily flip through branch views in the admin panel or view the entire database in one place. From the smallest to the largest, every branch of your organization will have access to all of the tools SilkStart offers. 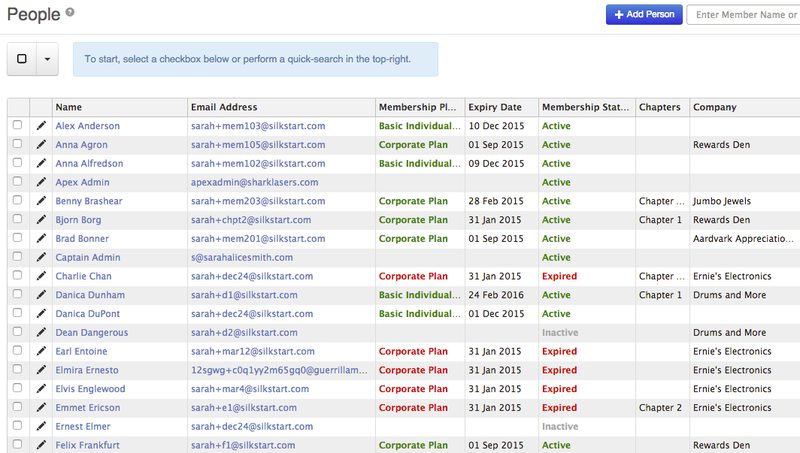 Reach out to members at every level of your organization with configurable mailing lists.